Favourite food: A good English breakfast. Would most like to meet: Angela’s father. Most interesting fact: He lived in East Africa until he was four. The Governor. The Boss. The man whose name is on our signage and above our door. The man we all call… Richard. With his kind and generous nature, his genuine interest in people and their stories, and clearly an excellent nose for business, Richard is our figure head, our commander and one of the many reasons why we all like working at Richard Harding so much. An original Bristol boy, Richard qualified from Cambridge University with a degree in Land Economy and a blue in rugby. His nifty long pass earned him a place at Bristol RFC, as well as several caps for England. Richard is too modest to tell you this. We however are not. 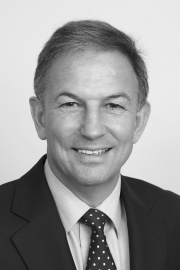 Off the rugby field, Richard is a qualified Chartered Surveyor, and along with his wife Angela, they established Richard Harding Estate Agents in 1996 (this origins story is epic and thrilling, but alas we do not have the space for it here). Richard lives with Angela and their dog Molly in Redland, and in his spare time (if Angela can ever get him out of the office) he enjoys walking, any kind of sport and current affairs.